I kept telling Chelsea I was not doing any shopping until we got through the party. I didn't want to have anything else to think about until the party was over. Well since Monday was two days after the party Chelsea figured it was time to go shopping. We headed out to Bed Bath and Beyond since we got our start with colors from Renee's gift to Chel. 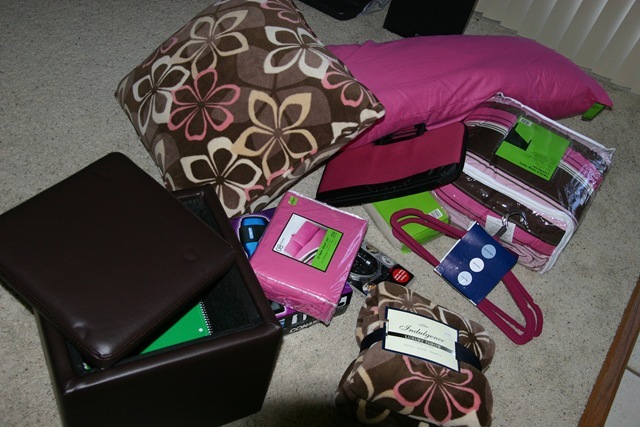 She got her the adorable ottoman (which had another smaller one in it) and the brown and pink flowered throw. We proceeded to find the big pillow, hangers, laptop lock, laptop carrier and more at Bed Bath and Beyond and they were so helpful! They will let you go through and scan what you want and have it waiting at the closest location to your college and they found they had one 4 miles up the road from Kent. But for us, Chelsea didn't get too much yet and she couldn't wait to take it home. Then we traveled over to Target to pick up the extra long sheets that are required, the giant pillow, comforter and hair dryer. Well at least its a start!